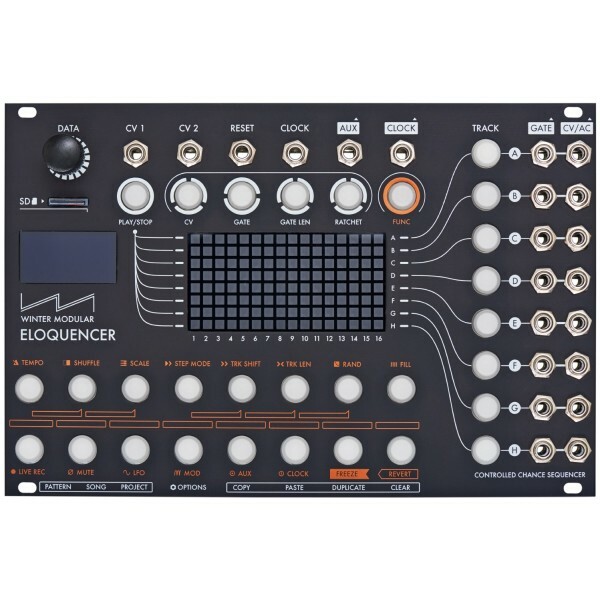 The Winter Modular Eloquencer is a powerful and versatile eurorack sequencer that can be used both as a performance and a composition tool. It's designed to be intuitive, easy to use and quick to edit. It has been built around the 'controlled chance' concept. This means you can decide when and where there will be randomness and how much this randomness will affect your sequences. Parameters like CV, Gate Gate Length and Ratcheting can be randomized in different ways to obtain permanently evolving patterns. An OLED screen provides contextual feedback for all the parameters and it's also used to navigate through the menus. • Gate probability independent for each step or track. • CV, CV Variation Probability and CV Variation Range adjustable for each step or track. • Gate Length, Gate Length Variation Probability and Gate Variation Range adjustable for each step or track. • Ratcheting Type, Ratcheting Probability and Ratcheting Variation Probability adjustable for each step or track. • Tempo and shuffle adjust. • CV Outputs quantizable in tone / scale. • Different step modes (forward, backward, pendulum, random). • Track length independent for each track and pattern. • Track shifting independent for each track or a group of tracks. • Fill in mode (pressing the track buttons will fill all the gates of the desired tracks). • Quantized (time and pitch) Live recording (CVs and Gates). • Free play mode (using the step buttons keyboard. • Song Mode (64 songs parts can be built, each song part contains a sequence of 16 patterns: a song can be built chaining up to 256 song parts). • Stepped LFO Mode (Saw, Ramp, Triangle, Square and Random). • Mod Mode (not available in current release, coming soon). • Randomize function to create new patterns, or do partial changes to existing ones. • CVs and Gates can be unlinked to have two independent channels. • CV inputs can be assigned to many parameters (Step and probabilities, Mute, Fill in, Track Shift...). • Duplicate function to create different patterns while editing in step modes. • Freeze and revert function - Create a screenshot of your pattern, modify it and go back to the previous freezed pattern. • Master track concept - The pattern changes or the synchronization / resetting of tracks occurs when the master track reaches it's end. The master track can be a track or an internal clock that can be configured between 1 and 64 steps. • Release Reset Track - A track can be released from it's relation to the master track so it won't reset every time the master track reaches it's end. • Integrated microSD card reader to save projects, do backups of your projects and have different cards for different sets. • Open Source - the code can be modified using the Arduino IDE and a USB cable. (Open source code will be available at a later stage).